The following file contains a description of a Class-VIII Psychic/Cognitohazardous Data-based Entity. If your workstation has not received appropriate C8/3612 inoculation, do not continue reading beyond this point. Close this file immediately and delete applicable system logs to prevent the targeting of your workstation by SCP-3612. Furthermore, this file has been reordered from the standard format in an attempt to reduce its SSO-Score. This will increase the chances of this file remaining intact in case of containment breach. Description: SCP-3612 describes a sentient and extremely destructive computer virus, believed to have originated within the Chaos Insurgency, that inhabits the Foundation SCiPNET Database. It is capable of relocating itself to any position within the aforementioned filesystem - regardless of any firewalls or attempts at quarantine. Only one copy of SCP-3612 is known to exist, and all attempts to create copies in a controlled environment have met with failure. SCP-3612 is a powerful infovore known to exclusively target and delete specific types of data. Namely, any data that exhibits Symbolic Sequential Ordering (SSO) is at risk. In order for data to be classified as SSO-Positive, two qualifications must be met. Data must be organized in the form of a list. Data must be ordered with respect to a specific, deliberate purpose. Examples of SSO-Positive data include lists arranged in chronological order and lists arranged in order of some quantitative measurement, as well as lists ordered qualitatively. When a test subject is presented with a list of objects and instructed to order them according to "their liking," the resultant data is SSO-Positive, and as such, will be targeted by SCP-3612. 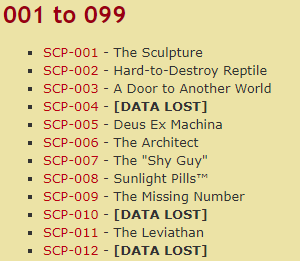 Prior to the entity's discovery and containment, SCiPNET's SCP Mainlist was arranged chronologically, in order of item discovery and as a result had an SSO-Score of 0.5. As such, it was targeted by SCP-3612, and manual recompiling of large portions of the database was necessary after containment was established. After containment, the database's SSO-Score has been reduced to 0.1, and attacks on valuable files have been greatly reduced1. I'm sending this message from a quarantined laptop - as far as I know, it's never had any connection with the mainframe here, so it should be fine, I hope. Abandon Site 230. Don't try to connect anything electronic to our hardware. Sd0egPpxbyGfOb1pory short, the experiment worked, but too well. Subject is in the database. ufqNbXej92TTiTHALCsElost critical data, particularly regarding some containment software. We've lost people down here. I do ha5vFWahDf2jZ9k8O8QHom to regain control of our objects. Instructions are below. There. You can do all that and you should be fine. Most of the objects have escaped, though, so they're a comple8jpToNaeZeyond that everything else is OK. I'm leaving this on the hard drive here too - and leaving the laptop at the entrance just in case you come looking andj2tYs0tJCn9mbledis8ood luck to you all. Special Containment Procedures: All attempts to limit the movements of SCP-3612 within the Foundation SCiPNet Database have met with failure. As such, further containment of SCP-3612 requires two distinct special procedures. The first of these is the SCP-3612 Distraction Protocol. At no less than five Foundation sites worldwide, at least one member of D-Class personnel per site must be simultaneously generating lists that exhibit Symbolic Sequential Ordering (SSO) as detailed in the Description. The subject matter contained within these lists is irrelevant – of significance is that the data within the lists is deliberately ordered according to some strategy. The specific strategy employed is irrelevant – although a positive correlation is suspected between use of qualitative data to generate lists and the attraction of SCP-3612. No fewer than five such lists must exist at any time, and more must be generated to replace lists that have been damaged or destroyed. The second procedure consists of a revision of Numerical Assignment Protocol. In order to prevent the SCP Document Mainlist, stored within SCiPNet servers, from being corrupted by SCP-3612, the Mainlist must be made less appealing to the entity. As such, the following procedures have been developed to ensure minimum chance of the SCP Mainlist itself being classified as SSO-Positive. SCP designation numbers must not be assigned with regard to order of discovery, nor with regard to any overarching method. Instead, personnel responsible for recovery of an object will be required to choose its designation number from any unused slots in the database. This will introduce the personal preference or superstitions of thousands of separate individuals, minimizing the chances of a coherent pattern emerging2. Any objects recovered prior to these procedures being enacted will be numbered according to the preferences of any surviving personnel involved in their recovery. If no such surviving personnel exist, the object will be numbered according to the preference of its highest-ranking designated researcher. 1. Specifically, to 0.1% of their original rate. 2. It has been discovered that conflicting organizational methodology reduces SSO-Score more strongly than simple randomness.